The Prizm Entertainment stage and ready for the show. The mobile sound system and stage rolling down the road to the next event. This mobile stage and sound system is perfect for any event. 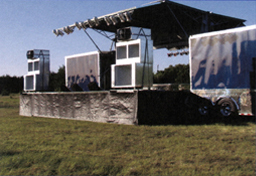 Prizm Entertainment offers the complete solution for a stage presentation in a totally self-contained mobile stage and trailer, complete with all necessary sound and lighting equipment. Prizm Entertainment has developed its new complete sound and lighting mobile trailer. The trailer hydraulically converts to a 24 x 30-foot stage in less than two hours. We offer a three-man crew with full tech support and a sound engineer. This mobile stage and sound system is perfect for any event. For larger events, additional sound and lights are available upon request. We stand ready to meet your entertainment needs and can be setup in two hours if necessary. © 2009 Prizm Entertainment. All rights reserved.